I probably sit in front of my laptop 15 times a week with the intention of writing a blog post. And every time, I turn away with nothing accomplished. I seem to be stuck, with plenty of ideas and no drive to take these ideas to completion. Motivation is hard to find, and I seem to have lost mine. The solution, I think, could be to start fresh, and give myself a clean slate. That doesn’t mean that I’m deleting everything and pretending that it didn’t happen, rather, I’m making the decision to improve upon my efforts, in many of the spheres of my life. More time to be spent simply writing, more time dedicated to doing my best in school, and more time spent being the best person I can be for myself. If you know me, you know I’m quite bad at replying to messages and being on top of my social media. I can spend hours on my phone a day and completely ignore messages. It’s hard to explain, but sometimes I don’t have the energy to be social and engage with people. It’s so hard these days to cut off any form of social media, as we’ve become so accustomed to being engaged and being able to contact people at any time and expect a reply almost immediately. This is something I’d like to explore more on the blog in the next few months, as exams will be coming up sooner than we all think and it’s so easy to waste valuable time on our phones. Even easier is to become fatigued and overwhelmed by the expectation of being constantly available, to the detriment of your own mental health and your studies. I’ve been at home for a week now, and I still haven’t been able to get my life together enough to post here. I’ve had tons of ideas and been in the kitchen almost constantly, but I’ve mostly been trying other peoples recipes and not trying my own creations. This week hopefully I’ll be trying out some of my own recipes and getting those up soon! It’s been a while since I’ve been down this neck of the woods, but I’m back (again). My second year of varsity is turning out to be much more overwhelming than I initially thought it would be. I always find myself generating ideas for this blog, and never finding the time to actually sit down and write. Assignments and literally hundreds of pages of readings have taken up a considerable amount of my time, and when I’ve finished that all I want to do is watch series, or listen to podcasts. This shouldn’t be the case, but the last thing that I’ve wanted to do is write. Between essays and assignments (and my Netflix habit), I’m always in front of the screen. My sleep habits have gone out the window, and generally, I’m not being my most productive self. I’ve spent a lot of time outside in recent weeks, and the changing season has meant that I’ve witnessed some really beautiful landscapes. There are only a few weeks left of term, and I’m really thankful. it’s been a long few weeks and I’m ready to get back home to cook and do fun things! Being at home also means that I’ll have so much more time for this, and hopefully, I’ll be getting a lot more content out in the next month. Hey there everyone! If you’re seeing this, it means you’re on catherineandcranberries.com – that’s right, catherineandcranberries.wordpress.com is no more, and we’ve moved on to bigger and better things! I decided to invest in my own domain, which was only possible because so many of you have shown your support, which I’m very grateful for. Now that I’m back at home (at last!) I can really get back into making all sort of delicious foods, the first being these vegan lemon bars or cookies. The recipe is based on another favourite biscuit that I make often, but substituting for plant-based ingredients. Today’s recipe is one I created myself, and is accompanied by a video! It’s been a while since I filmed and edited anything, but it’s something to look forward to on Catherine and Cranberries as I hope to be able to put together more in the future. First, you’re going to start by creaming the coconut oil and the brown sugar. Add the lemon zest and the lemon juice to this mixture. Sift the flour and baking soda into the wet ingredients, and mix until a crumbly mixture forms. Add the almond milk, and combine, using your hands to help it form into a dough. Wrap the dough in cling film and chill it in the fridge for ten minutes. Use this time to make the glaze by combining the ingredients and mixing thoroughly. Press the mixture into a lined baking tray and bake for sixteen minutes. Let it cool completely before icing it. 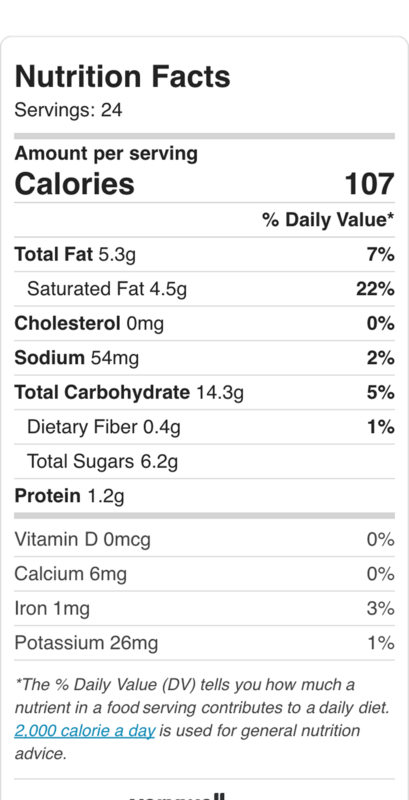 Here is the nutritional information for this bake! It’s Tuesday. My room is tidy, but my bed unmade and my mind is in disarray. But some of today has been good. I spent time with a good friend and felt so much better having spoken to someone who I know cares. My best friend and I spoke at length last night which always makes my day. But I have a term essay due on Friday. Procrastination is inevitable. It happens more than I care to admit – I try my best to complete my work well in advance but somehow it becomes the day before the due date, and there is still work to be done. It’s the middle of October, and it still doesn’t truly feel like the year has started properly. I still disjointed and unadjusted in my new space. As I look around my room, it feels like I’m in a strange place. It’s weird to be working at a desk in a quiet space when I’m used to our dining room table at home, and the sounds of my family all around me. I think it’s clear that I’m homesick. Res food will never match up to my mom’s homecooked meals, and the constant smell of cake or jam or soup being made that floats through our home. Food is one of the things I miss most about home because it’s so much a part of our daily lives. If my mom and I go shopping in the morning, we know we have to be home for lunch. To me, it is some of the best time that we spend altogether when it’s so easy to do our own thing all day. Study week is next week, and as I said, I’m not sure where the year has gone. It seems that it was just last week that I arrived in Grahamstown at the foot of a brand new, daunting opportunity. Now I’m preparing for the final exams of my first year and handing in the final few assignments of the year. It’s been a wonderful year, but nothing makes me happier than to know that the end is in sight. G-Vegas has been a treat for the past ten months, and I’m so glad that I chose to come here, but I’m definitely ready to head back to Pietermagicburg for a couple of months. I’ve been very quiet over here for the past little while, purely because I needed time to focus on varsity and myself, but I’m feeling much more motivated to come back to Catherine and Cranberries with new energy. Lots of exciting things are coming up soon, and this holiday holds many new opportunities. Watch this space!